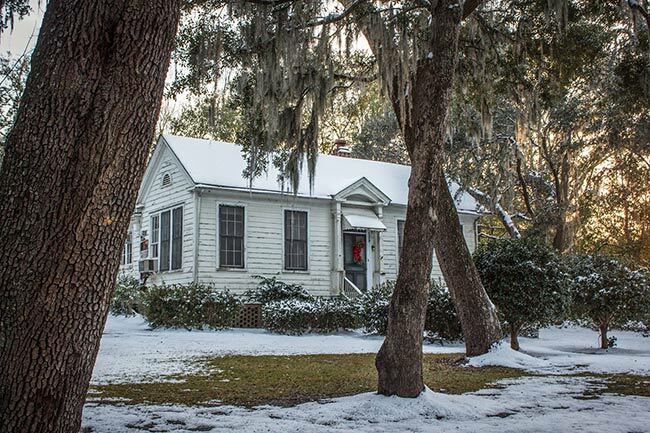 This small but elegant home, known as Quarters J, is located near the entrance to the Officers’ Quarters District of the former Charleston Navy Base. It was constructed in 1934 on the former site of a schoolhouse which had been relocated within the Navy Yard and itself repurposed as quarters for boatswains. The Navy Base was developed in 1901 at Chicora Park, a public garden commissioned in 1895 by the City of Charleston. The park, which was accessible by trolley from the peninsula, was designed by the Olmsted brothers, sons of notable landscape architect Frederick Olmsted, who is best known for designing Central Park in New York. 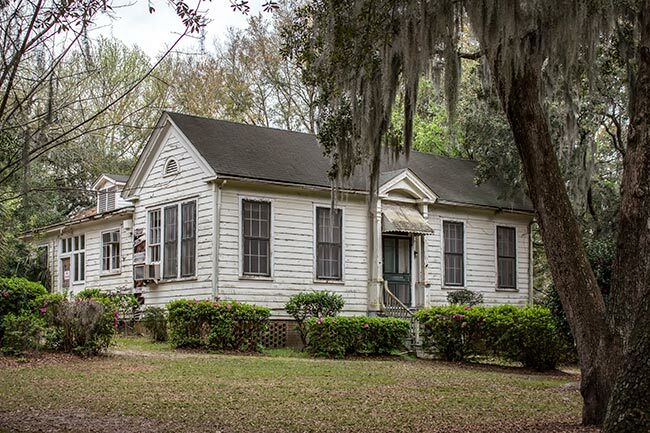 A Victorian-era home now called Quarters F stood within the park and served as the custodian’s cottage prior to the park’s development as a naval complex. Constructed in the Classical Revival style, the house is simple in scale. While other homes in the district are grand and commodious, this structure represents a shift towards more sustainable housing. T-shaped, the house consists of a rectangular portion in the front and a central rear wing which was added in 1942. The house is slated to undergo rehabilitation starting in late 2019. Its future use will be as an office for the Charleston Naval Complex Redevelopment Authority. 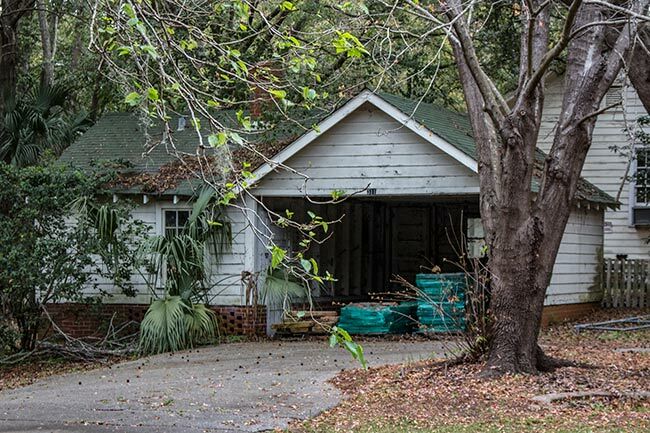 A detached garage, also built in 1934, exists behind the home. Servant’s quarters – consisting of a maid’s room, bathroom, chimney, and storage area – were added to the garage in 1942. 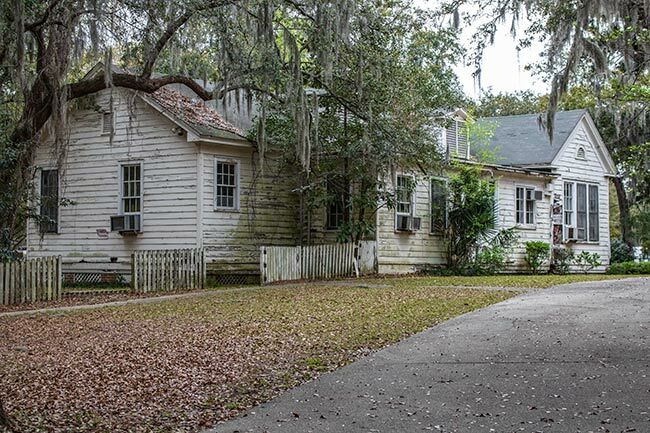 Quarters J is listed in the National Register as part of the Charleston Navy Yard Officers’ Quarters Historic District. Quarters J, 311 Navy Way (1934) (CNY # J): Quarters J was constructed in 1934 as an officers’ quarters in the Colonial Revival style. It was constructed on the site of the officer qua rters’ school building, near the entry to the complex. The scho ol was relocated within the Navy Yard for quart ers for the Yard Boatswain. The new quarters location on the old school site was, therefore, not sited to take advantage of the topography. This residence has 2,319 squa re feet and is one-story with a T-shaped plan. The front elevation faces north. Walls are of frame constr uction with wide clapboard sidi ng painted white. The walls rest on a red brick masonry pier foundation; the brickwork has the open pierced lattice configuration that was a later addition between original brick piers. The primary entrance is located in the center of the symmetrical five bay configuration of the north elevation. Wooden steps with a heavy molded wooden handrail a nd straight pickets access the entry. The entry consists of an attenuated Adamesque center–gabled portico that extends up through the eave-line of the building. The simple molded portico with a segmental arched underside has an entablature that returns and is continuous above the entry’s flanking elongated wood columns and cornice. Above the single wooden six-panel door is a Federal style rectangular transom with a semicircular fanligh t with tracery swags and two roundels at the upper corners. A metal awning added in the late 1930s projects from above the doorway. Fenestration of the north elevation is symmetrical w ith two six-over-six-light double- hung wood sash to either side of the entry. 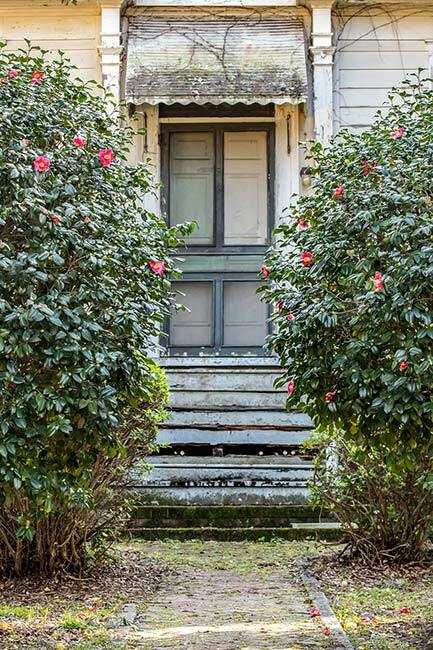 Secondary entrances include three pairs of ten-li ght, French doors each with a two-light transom opening onto a screened one-story veranda at the southwest end of the building. A secondary entrance also opens to the rear east elevation. Th e fenestration of the secondary elevations is symmetrical with single and triple wooden double hung six-over-six light windows. Sills are wood. Aluminum gutters and downs pouts provide drainage from the roof. Two red brick corbelled chimneys with metal screen caps project from the moderately pitched intersecting gable asphalt shingle roof. The gable ends are open with semicircular louvered gable vents and a molded cornice completi ng the roof gable and eave. Two gabled dormers with large louvered vents for attic fans we re added in 1952 and project from the east eleva tion of the rear gable. A 1942 rear one-story addition extends fourteen feet, ten inches from the original rear wall and houses a chamber and bath.